Solar Boat | PlugInCaroo… Karo plugin… abhi!… save the environment!!! This all weather kayak reminds me or Noha’s Ark… this could also develop into a military missile or torpedo to attach enemy ships! Solar Voyager is a project carried out by a couple of friends Isaac Penny and Christopher Sam Soon for the past four years and has seen really became reality last June 1 to leave terra firma. There is a long road ahead, and possibly reaching end French, Spanish or Portuguese coasts, depending on weather conditions. With a size of four meters long and one meter wide, the “kayak” has enough room for two solar panels that give life during the four months last estimate that route. It’s funny, but the guys are looking for people at different points where you can get Solar Voyager, as the vehicle will reach that point in October, and none will be there to receive it. It is possible to follow the direct course of Solar Voyager, this link, and the time when we write these lines, it takes 526 kilometers. The statistics are updated every 15 minutes via satellite. As the boat was designed in the United States but actually created in Singapore. 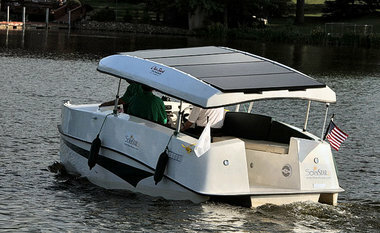 Almost everything in it has been created quite a craft, and carries solar panels 240W. Obviously this is a type of panels designed to withstand bad weather and moisture will live for many months in the middle of an ocean. This entry was posted in Uncategorized and tagged Noha's solar ark, Solar Boat, solar missile, solar ship, solar torpedo on December 13, 2016 by PlugInCaroo.